Playing games with your teacher is okay, but playing games with another kid is way better! But what can we do when it’s a private lesson? 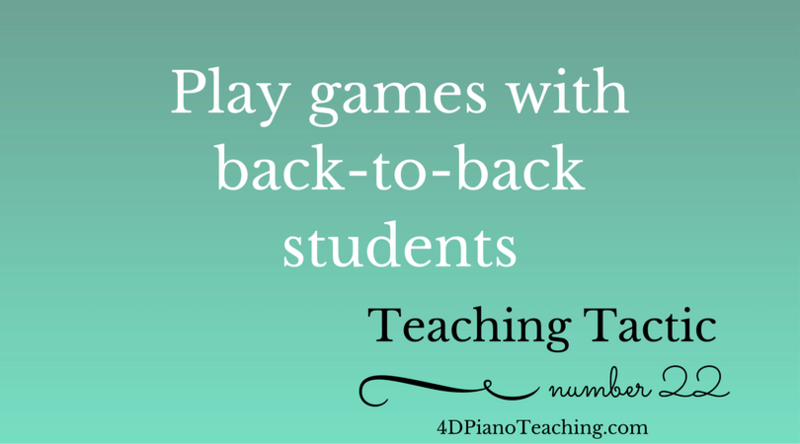 Our Tuesday Teaching Tactic this week is to have back-to-back students to play games together. Our students often arrive a few minutes early for lessons, why not pull the next student in and have both students play a game together? The parents notice that their student is getting a little bit of extra teaching time, and the students love it. This obviously won’t work if you have a four-year-old followed by a seventy-five-year-old. But if the students are close in age they can really benefit from playing a piano game together. Need some ideas of what games to play? Check out our Game Round-Up post for a list of free printable we’ve created for you!